You can’t say you’ve been to Singapore until you’ve eaten breakfast, lunch and dinner at a hawker market. All in the same day, if you’re feeling adventurous and/or hungry. Beyond Singapore Slings and the Marina Bay Sands, the food centres are where you’ll find a truly iconic, authentic side of Singapore. They’re huge, bustling smorgasbords where many owners have served the same local delicacies at the same stall for decades. Practice makes perfect, especially when it comes to wanton mee. At the markets, you’re just as likely to find a suited-up business crowd grabbing a mid-week lunch as you are a gang of retirees chowing down on char siu at four in the afternoon. It’s a place where everyone – travellers, in particular – is welcome. Just make sure you “chope” your seat (leave a pack of tissues on your chair to save your spot) at the share tables, BYO wet wipes, and get chatting with a bunch of friendly locals. To help you get started on your culinary journey, here a guide to five of the Garden City’s best hawker markets. The golden rule at hawker centres is to always follow the crowd, because when there’s Michelin-starred street food on the line, queues are your best friend. And perhaps there is no longer line than that for the pig’s armpit at Tiong Bahru Market. Honestly, line up for it. This neighbourhood used to be a Chinese burial ground back in the 1930s, but today, it’s a trendy, inner-city heritage district. Laidback and low-rise, this is a town that flies under the tourist radar. Breakfast here is a very local affair. Start with a strong black kopi (brewed and filtered coffee) followed by the chwee kueh (steamed rice cakes topped with turnips, dried shrimp, chilli and shallots). It may not sound like much, but it’s an extravaganza for your mouth. Promise. Celebrity chef Gordon Ramsay has visited the Maxwell Road Food Centre, and he lost a cook-off to the Tian Tian Hainanese chicken rice crew. Which makes sense when you consider that another celebrity chef, Anthony Bourdain, described the rice as “so fragrant and delicious it can be eaten on its own”. If that doesn’t make you want to line up for an hour for steamed chicken, nothing will. The Maxwell Centre is home to more than 100 stalls and can be found smack-bang in the centre of Chinatown. 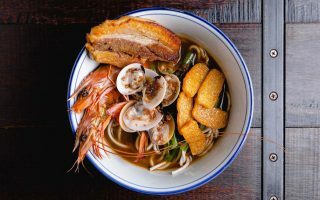 Must-try dishes include Zhen Zhen wholegrain porridge, Special Shanghai tim-sum (fried dumplings); traditional Cantonese fish bee hoon soup. Oh, and durian, a large, super scaly fruit that smells like the worst thing you can imagine. But don’t let that put you off, because it tastes better than it smells. Did you know Singapore has a mainland beach? 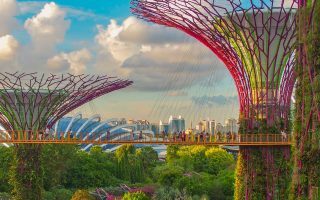 It’s called East Coast Park and it’s about 15km east of the city centre and, if you’re a seafood connoisseur, then the East Coast Lagoon Food Village is the hawker market for you. Just stroll along the promenade, go for a dip in the warm water, and then sit down at the laidback market for lunch. High on the must-eat list is anything wrapped in banana leaf, like salmon, stingray, and prawns. High on the must-drink list is freshly pumped sugar cane juice and ice cold Tiger beers, naturally. Set right in the heart of Little India, the Tekka Centre is everything you want it to be. There are ladies in saris stepping down the street, the smells of a genuine South Asian bazaar wafting on the breeze, and colourful window fronts selling all manner of herbs. Join the local Indian, Sri Lankan and Bangledeshi people here for a traditional, and delicious, feed. Feast on mutton biryani, flaky dosas, and fiery curries before washing it all down with a chilled mango lassi. This district also provides some of the best people watching this side of Bollywood, so grab a perch and an extra samosa and stay for the afternoon. 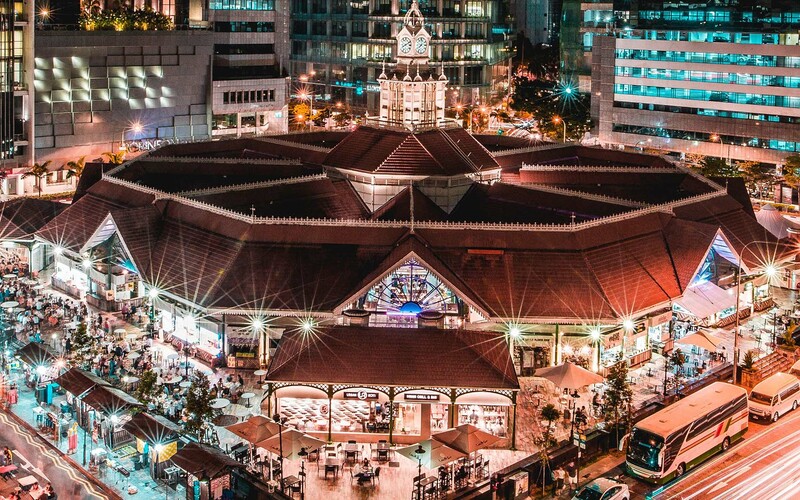 Lau Pa Sat is probably Singapore’s most lovely hawker address. 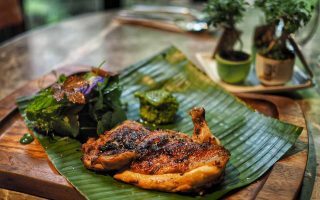 Located in a cast iron Victorian-era building surrounded by CBD skyscrapers, Lau Pa Sat is like a traditional slice of paradise among the modernity. Head here in the evenings when the crowds spill out onto the streets and there’s a fun, festival vibe every night of the week. The thing to eat here is satay – all kinds of satay. Barbecued right in front of you, you’ve never tasted anything so delicious on a stick. They didn’t nickname it “Satay Street” for nothing.